“Now after John was arrested, Jesus cane into Galilee, preaching the gospel of God, and saying, “The time is fulfilled, and the kingdom of God is at hand; repent, and believe in the gospel” (Mk 1:14-15). I had read or heard these words many times before I was struck by the order. Repentance comes before belief. Once I had noticed this, I began to wonder about it. Could the order be important? I had always thought belief would come first and then repentance, but apparently not. In Acts we read that John the Baptist’s baptism was one of repentance: “Before his coming John had preached a baptism of repentance to all the people of Israel” (Acts 13:24). John’s baptism of repentance came before Christ was even proclaimed. Then Christ came with a new kind of baptism. “And Peter said to them, ‘Repent, and be baptized every one of you in the name of Jesus Christ for the forgiveness of your sins.’” (Acts 2:38). It only makes sense that we would have to repent before we could be forgiven. But even before that, we need to know we are sinners so we can repent. If people don’t even know that they are sinners, how can they hear the Good News of the Gospel? After all, the Good News is about salvation from sin, and if we don’t know we are sinners we have nothing for which we need to repent and there is no good news. God had prepared for that many years before when he gave the Israelites the Ten Commandments. As St. Paul tells us: “For no human being will be justified in his sight by works of the Law, since through the Law comes knowledge of sin” (Rom 3:20). The Israelites saw themselves as privileged, a chosen people, because God had given them the Law. They had gained the “knowledge of sin.” They at least knew what was sinful, but the Law, including the Ten Commandments, could not save the Israelites: “For the Law brings wrath, but where there is no law there is no transgression” (Rom 4:15). They had to await the “Good News” that Jesus would bring. So, the first steps are to know we are sinners and then to repent of our sins. I too need to remember this. I recall a day I was with a Christian friend riding in a car with some people we had met who were not Christian. Somehow the conversation came around to our Christianity and why we believed. After a fair bit of conversation, my friend shared with our new acquaintances the parable Christ told about the good shepherd leaving the flock and going off to find the lost sheep. The parable concludes with the line, “Just so, I tell you, there will be more joy in heaven over one sinner who repents than over the ninety-nine righteous persons who need no repentance” (Lk 15:4). I assumed my friend was suggesting that there would be more joy in heaven if these people we were with would accept Jesus into their lives than there would be for us two Christians. That could be true. On the other hand, it struck me, who are we to assume we are “righteous?” After all, in Matthew’s Gospel we read: “And as he sat at table in the house, behold many tax collectors and sinners came and sat down with Jesus and his disciples. And when the Pharisees saw this, they said to his disciples, ‘Why does your teacher eat with tax collectors and sinners?’ But when he heard it, he said, ‘Those who are well have no need of a physician, but those who are sick. Go and learn what this means, “I desire mercy, and not sacrifice?” For I came not to call the righteous, but sinners’” (Mt 9:13). On further reflection, I thought it best not to count myself “righteous” at all. 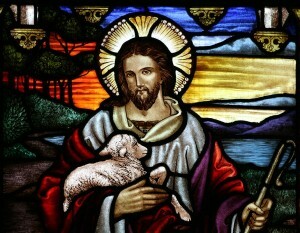 I wanted to be the one sheep Christ comes looking for. But I can only be that sheep if I see myself as lost, as a sinner, as sick and in need of the doctor. As long as I think I am righteous, I have no need for repentance. The Pharisees offered sacrifices, but what God wanted from them was mercy. Christ would offer the one sacrifice necessary. Christ will also give us all the mercy we need. Look at who comes to sit with him, sinners of all kinds. They did not fear him. Even when he demonstrated through his miracles how powerful he was, they still approached him. It was not fear that kept people away from Christ, but self-righteousness. Those who saw themselves as sinners and repented saw in Christ mercy itself. If we are self-righteous we might think some kind of sacrifice, some good work will bring us salvation. If we are repentant sinners we know that there is no good in us other than what God has given us. We recognize there is no hope but in the mercy of God, and this is the good news. God is all merciful to sinners. “Repent, and believe in the gospel.” I think the order is important. It is difficult to see the Gospel as “good news” if we are not repentant sinners. This is why the Pharisees did not get it, did not hear the good news Christ was proclaiming. To truly hear the Word of God, we must be humble and acknowledge our sins and repent of them. So, let us repent and hear the good news Christ has for us. In his love and mercy he has saved us from our sins.